Most dogs respond well to conventional obedience training. Others experience all sorts of challenges and we need to find out the source of the miscommunication. As an intuitive animal behaviorist my goal is to understand the dog’s perspective as well as the human perspective. A human’s perception and the animal companion’s viewpoint about identical circumstances can be very different, or just slightly so. Big or small, the point of divergence is the source of misunderstandings. Non-verbal animal communication allows me to side step the pitfalls of speculation and ask animals directly why they do what they do. They answer willingly and help clear up the confusion about their circumstances. Muffin and Cruiser both came to my office after weeks of training with reputable trainers. Muffin’s person, Carolyn, was in tears. She and Muffin were inseparable since the dog was 12 weeks old. Their 8-year relationship was going through a melt down. 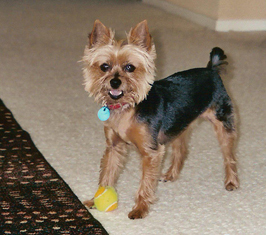 Muffin, a Yorkshire terrier, went from a happy dog to an anxious, aggressive one. Left alone she peed in the house and barked her displeasure and frustration. A professional trainer felt the solution was to establish Carolyn was in charge of her dog and not the other way around. Ignoring Muffin in specific circumstances was an important component of creating healthy boundaries. It worked. Muffin became subdued and cooperative. Muffin: I am so excited to be here. So. I love it here (BN’s office). Here is so much fun, so much fun. Please let my person know I am bored, bored, bored. I need something to do. I am bored. I have come in to be a companion. I am a very good companion. BN. Please explain, Companion. Muffin: I need to be talked to; I need to be included. Right now I am not included. I feel left out, out, out. Candidly, she added her person had become boring. To my amusement, she informed us Carolyn’s husband had always been boring. Then I asked her about her aggression episodes with other dogs. After some hesitation, Muffin explained with emotion: I don’t like other dogs. I am not a dog. BN: Then what are you? Muffin: A companion, a companion a companion. BN: What do you mean when you say you are not a dog? Muffin: Dog is ignored; dog is not important. I am very important. A discussion with Carolyn revealed her husband had retired and they lived at a much slower pace. In order to keep him company many of the outings and activities she and Muffin used to enjoy fell by the wayside. She tried play dates, Muffin became aggressive. All along Muffin had been acting out her frustration. The changes in the home just didn’t suit her nature or personality. Ignoring her in order to create proper boundaries and leadership addressed the effect, but not the root cause of the boredom. During the session Carolyn felt scales were lifted from her eyes and she finally saw what led her little friend to become contrary. We designed a program that incorporated new outings, plenty of exercise and no play dates. Some dogs prefer the company of human beings. Which is perfectly okay. It only took a few weeks of the new program for Muffin to regain her former good cheer and behavior. Four years later, thanks to this clear line of communication, Muffin continues to delight Carolyn who knows how to keep her slightly less active 12-year-old companion content and well behaved. Cruiser’s uneven performance in novice obedience was a mystery to both people and trainer. On the street he reacted unpredictably and fearfully. He made his handler nervous which didn’t help at all. She felt like she failing him in someway. 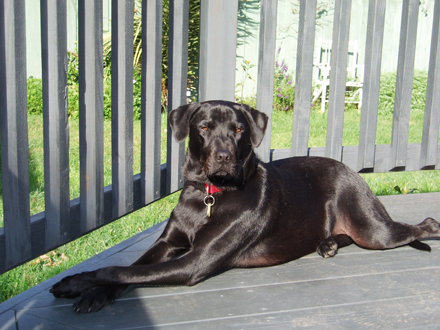 As a well bred 9 1/2 month black Labrador mix he was expected to do better. Shipped as a puppy from North Carolina he arrived very scared and anxious in San Diego. Had that experience permanently affected and traumatized him? Best go to the dog to find out, I replied. We’ll see what he can remember. I asked him several questions and Cruiser provided invaluable insight about his troubles. I have come to learn. Everything is new to me. Everything is strange and new to me everything. I asked him what he had been before, in his most recent past life. I was a dog, but not a city dog. I have always been a country dog. Always. I know how to run in a pack. I know how to chase a rabbit, I even know how to jump a very high fence, but I do not know how to behave when things get noisy. When things get noisy I panic. When things get noisy, I forget. And when things get noisy, I make mistakes. They must slow down and be quiet; I must have my space, that is how I can think things through. Cruiser was in the life-process of acquiring fundamental coping skills for an urban environment. His cellular experience knew dog, but not city dog. I suggested Cristin and Ryan lower their expectations and adjust to his pace. He needed time to push through his reactive responses to nearly everything. Their dog’s entire lifetime would be a journey of learning how to deal with city noises and population density. With this invaluable information they knew what to expect and how to handle him. During the last four years they continued his obedience training and they exposed him incrementally, at his own pace, to unfamiliar situations. Both Ryan and Cristin worked on staying calm and assertive to give him clear leadership at all times, and found ways to quiet Cruiser. In his present home in the Bay Area, he is doing very well. Our boy goes on off-leash hikes in the hills and even romped in snow this winter. There, embraced by nature, he appears totally in his element. Brigitte Noel, M.Ms. is a long time San Diego based Animal Communicator and author. For more information on her nationwide consulting services for people and their animals go to www.BrigitteNoel.com or by phone (619) 295-5504.